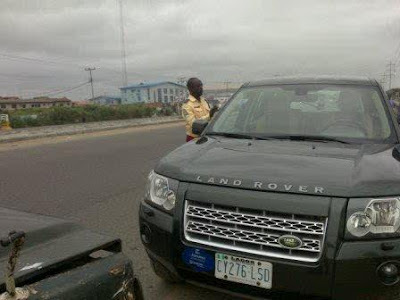 A female banker with Standard IBTC bank, Yinka Johnson, on Friday killed a LASTMA official,33-year-old Hammed Balogun, along Lekki-Ajah Expressway, Lagos State. LASTMA GM, Babatunde Edu who confirmed the story said the deceased was carrying out his official assignment at his duty post at Mega City, Ajah area of Lagos before he met his untimely death. later arrested with the help of the Area J Commander, ACP Felix Vwamhi. Edu said the female banker on realising what she has done, ran and escaped from the scene of the incident into Ikota Estate, Ajah with the security men shutting the gate permanently. He said: “The situation became riotous as the security attached to the gate refused all pleas to open the gate until the intervention of the Area Commander in charge of Area J, Mr Felix Vwahmi, mobilised and called for backup before access could be gained into the Estate. Pls my comment is not meant to draw any controversy but to say things as they occured because I was @ the scene of the accident from begining to the end. The lady in question was arrested for folowwing oneway close to an hour before the accident happened, she was not the person that killed the LASTMA official but a danfo driver did. There was a large crowd @ the scene all of them begging the LASTMA officials to pls allow the woman go but they refused. This danfo was coming from the tollgate 2 towards Ajah on high speed and LASTMA official was hit was making a call and was crossing at the same time to meet his colleague who was standing @ the median with fone in his ear pointing towards Ajah apparently looking to see if his men are actually coming. Before he could finish his call the danfo has knocked Mr Balogun down and in that pondimonium, the husband of the lady decided to play a fast by jumpimg into their vehicle and wanted to escape, she refused to give LASTMA the car key so was holding the key when the accident happened that was why they were able to drive the car away, it was in that process that the backup team arrived in hilux toyota and the officer that was struggling with the man not to drive the car away immediately saw his men started shouting..that’s the car, that’s the car and his started chasing the lady’s car that was speeding off with reverse, the LASTMA officials later apprehended the lady inside Ikota Villa Estate. The danfo that killed the LASTMA was serously damage, the windscreen shattered, the headlamp badly damaged but the lady’s car go and have a look @ it doesn’t have a single dent, it was in process of going after the lady that all the officials left the scene of the accident that gave the danfo man ample time to take his bus and ran away. By the time they finished with lady’s arrest and want to come and take the danfo he has gone, so it was not the lady that killed the LASTMA official but the runaway danfo. Pls let justice be done to this case. If she did not attempt to runaway when the team arrived there’s no way the danfo could escape. Thank you.